The Slayer and the Slain! I have the Showcase Presents: The Trial of the Flash volume, bought a couple years ago. That book has Flash 323-350…basically, the final couple years’ worth of issues of the Silver Age Flash series that took us up to Crisis on Infinite Earths prior to Wally’s series kicking off. I have "experienced" 28 years of reading new comics myself, all being years after this issue. And in broad strokes I’ve long since "filled in the gaps" or otherwise have "a passing knowledge" of stuff from this "era." But finding this issue in a 25-cent bin, I was all for it. Sure, I have the issue in that Showcase volume–but that’s black-and-white and a thick volume that’s not the greatest for a randomish, casual read. This issue is in color with all the ads and whatnot in being the actual, original, (vintage) edition. 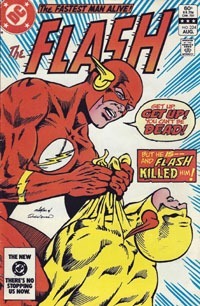 The cover is what grabbed my attention–The Flash holding Reverse-Flash and exclaiming "Get up, Get up! You can’t be dead!" 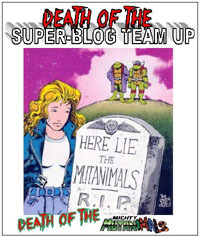 and a caption proclaiming "But he is–and Flash killed him!" This is both accurate and yet comes off very much as a number of classic covers do–a "technicality" of truth but quite misleading. Of course, I know this isn’t "just" that, but is indicative of an issue with a lasting point that influenced so much at the trailing end of the series. Then I figured I’d missed the actual occurrence, and "assumed" that this would pick up immediately after the PREVIOUS issue ending on an "Is he or isn’t he dead?" cliffhanger. What I got from this was a solid read from a key point in pre-Crisis Barry Allen’s life with one of his most dangerous foes, and an issue meeting expectation while drawing me into the then-contemporary story and leaving me curious about a number of things, not limited to: Iris died 40+ issues earlier? I did think that was here. Who is this Fiona, and how important was she as I’ve never consciously been aware of her? And how does an obvious rock-and-hard-place situation stopping a known killer with intent lead to a lengthy story of the Flash on trial? While I’d half expected to open the issue TO Barry and a dead Thawne, I actually found that the two were still engaged in fisticuffs. Said fisticuffs have made Barry very late for his own wedding, where family and closest friends try to salvage the situation, assuring folks he’ll be there and has NOT left Fiona at the altar. Kid Flash performs a "super feat" rescuing a baby and showing THAT he has the power and speed to do much of what Barry does…and even he is late for the wedding. Or would be, if it was proceeding as it should have. As the wedding situation deteriorates, Wally heads out to try to find Barry, and is intercepted by a Guardian of the Universe (not to be confused with a Guardian of the Galaxy…similar names, different publishers) who does something to dampen his powers, ensuring that no one will interfere with Barry’s fight…at said hero’s request, apparently. We then switch more fully to the Barry/Eobard fight and see a fraction of what goes on with two mortal combatants at super-speed. Ultimately, seeking to press whatever advantage he maintains, the villain takes the lead, heading to kill the woman who would be Barry’s second wife–forcing Barry to move even faster and decisively to save Fiona’s life. Standing before her as the Flash, he does not tell her that it’s him–Barry–and as she storms away, we learn that Thawne is not just "stopped" but dead. As said earlier, this cover looks like something right out of the ’70s and classic exaggerated/far-fetched situations. The art inside the issue is solid and seems very much of its time–early 1980s–with all relevant characters being distinct and recognizable, and generally no wonkiness or weirdness throwing me out of the story. Possibly the biggest visual grab for me was that somehow I keep forgetting that Barry was blond, and I’m still used to Wally and thus a Flash without red hair throws me off. Story-wise, this issue includes a footnote indicating that there were several issues’ worth of development leading to this one–and that by itself serves to pique my interest in finding those issues. It also reminds me that this is from those days long ago BEFORE everything had to be clearly deliniated within a rigid 4-issue or 6-issue "story arc" format…when issues could be issues, telling an ongoing story without necessarily being formulaic X Chapter of Y Story. I like the structure of this issue, giving us some heroics, super feats, as well as developing the wedding side of things and Fiona’s thinking she realizes what’s happened, then seeing Barry and Thawne and their battle, leading to Barry’s being forced (goaded into?) to kill Thawne to save Fiona. All in all, I definitely enjoyed this issue. It was an easier read than I expected, half thinking it was gonna drag on and feel overly wordy, as well as thinking I’d be reading simply a random chapter of something–not even a key moment–of a much larger story. Though in a way this IS just another ’80s issue, it being an issue included in that Showcase volume, I feel like it’s an ‘early chapter’ more than an ‘isolated issue’ but found this engaging and interesting, while leaving me interested both in backtracking and getting the later issues (as preferable to "just" a black and white reprint). For only 25 cents, it was well worth the purchase, a solid read, and I would certainly recommend the issue if you find it in such a bargain bin and don’t mind NOT having the entire 25+ issue "run" necessarily at hand.